Its been a long time coming but New York sleaze rockers Wildstreet will be releasing a new studio album Wildstreet III in the spring of 2019. “The surprise of the night was definitely Wildstreet. I wasn’t familiar with the group’s songs aside from the ones that I had posted in various Sleaze Roxx articles in the last few years including the new single “Raise Hell.” Wildstreet frontman Eric Jayk definitely looked like a rock star. He had a huge set of died blond and blue hair. 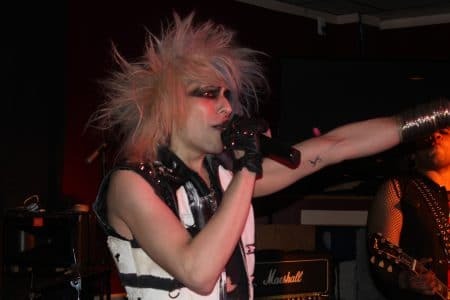 He was quite thin but muscled and reminded me of a shorter Michael Monroe. Jayk even addressed the M-Pre Party crowd by stating something to the like, “Bet that you’ve never seen people like us before?” Joining Jayk on stage was a brand new cast from the ones that had appeared on the group’s debut self-titled album.